Denver's Union Station was almost slated for a date with the wrecking ball in the early 1980s. Then, someone responded to the call and formed a group called Save Our Station. And thank God they did! After millions of passengers, Union Station was due for an overhaul and RTD needed some way to tie FasTracks into one neat bow. Look no further than the Beaux Arts classic great room of Denver Union Station. After millions of passengers, Union Station was due for an overhaul and RTD needed some way to tie FasTracks into one neat bow. 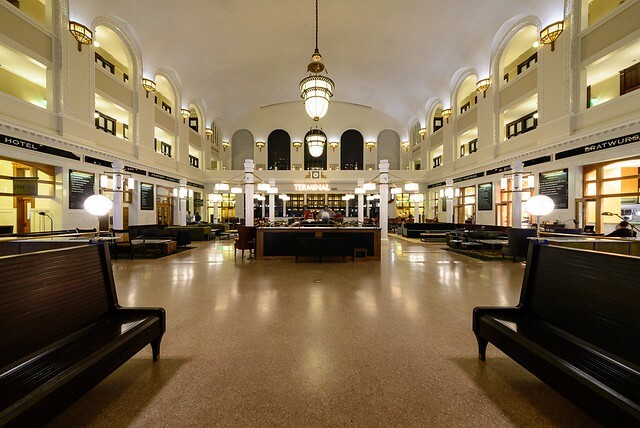 Look no further than the Beaux Arts classic Denver Union Station. Looking for all the world like a cross between a wedding cake and a grand library, the inside of Denver Union Station is something to behold. Christopher May captured the newly restored, antique elegance that rivals any rail hub of any city anywhere. The great hall has never looked better! The timed exposure almost leaves the impression that the area is deserted. Always open, even late on a summer night for this photograph, Union Station may never close again.